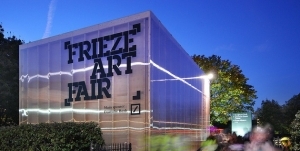 London’s Frieze Art Fair has announced its program of talks for the 2013 edition of the fair. Leading the names on the list are appearances by Jérôme Bel, Meredith Monk and Stephen Shore, among many others at the October art fair in Regent’s Park. This entry was posted on Thursday, August 15th, 2013 at 12:55 pm	and is filed under Art News. You can follow any responses to this entry through the RSS 2.0 feed. You can leave a response, or trackback from your own site.